Your body makes an amino acid called L-carnitine in the liver and kidneys and uses it to turn fat into energy. Normally your body can make all the L-carnitine it needs, but some cardiac or vascular diseases can cause low levels of L-carnitine in the body. Your body may not be able to make enough L-carnitine or can't transport it into the tissue where it's used. Consult a health-care professional before you take L-carnitine supplements. L-carnitine acts as an antioxidant, a substance that counteracts harmful particles in the body called free radicals. Free radicals – caused by normal aging, exposure to pollutants and toxins – can cause damage to your body cells. L-carnitine is used for a number of cardiac diseases such as heart failure and angina, or chest pain, as well as peripheral vascular disease and diabetic neuropathy. It may also be used in kidney disease, Alzheimer's disease and for male impotence. L-carnitine is found in a number of foods, including red meat, dairy products, fish, poultry, wheat, asparagus, avocados and peanut butter. It's also available in supplement form. The recommended dose is usually 1 to 3 grams a day, according to the University of Maryland Medical Center. Side effects of L-carnitine are usually mild. Doses above 5 grams a day may cause diarrhea, and occasionally you'll have increased appetite, body odor or a rash. High blood pressure, or hypertension, is a potentially serious medical condition that can cause heart failure or stroke if untreated. 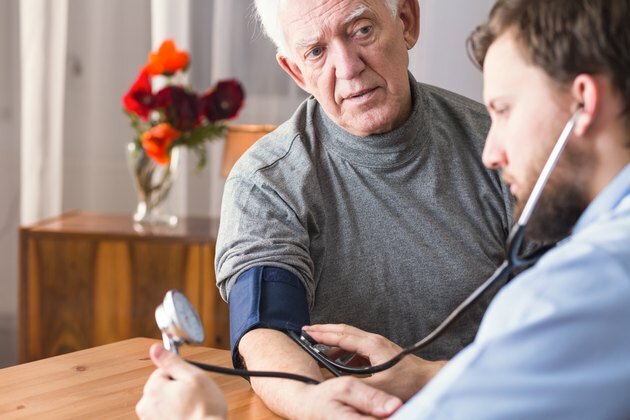 Medical treatment for hypertension usually includes lifestyle changes such as diet and exercise and may also include medications. Many medications are used to treat hypertension and they work in different ways. Diuretics lower blood pressure by decreasing the amount of fluid in the body. Other drugs dilate your blood vessels or change the body chemistry. L-carnitine may also decrease your blood pressure. In a study in the June 2010 issue of "Journal of Physiology and Biochemistry," L-carnitine significantly reduced blood pressure in hypertensive rats. A study reported in the February 2010 issue of the Asian journal "Zhonghua Xin Xue Guan Bing Za Zhi" found patients with pulmonary hypertension had a significant reduction in blood pressure and improved exercise tolerance when given L-carnitine intravenously. Research reported in the September 2009 issue of "Hypertension" found 1 gram of L-carnitine given twice a day decreased blood pressure in patients with increased cardiovascular risk. Although L-carnitine has relatively few side effects, it can lower your blood pressure. If you're also taking an anti-hypertensive medication, the addition of L-carnitine could lower your blood pressure too much. Consult a health care professional before you start to take L-carnitine, especially if you're already taking high blood pressure medication.